Time to cut loose! Have a rockin' good time introducing children to the fun of Footloose, rewritten for children by the one and only Kenny Loggins. Jack the zookeeper joins the zoo animals in an all-night dance party!Â Little ones will love the cast of characters, including the rockin' chimp Louise ("Geez, Louise! "), Mister DJ Elephant, the lemur Marie ("Oo Wee, Marie"), Milo the wombat, Luke the funkiest cat in the zoo, and so many more rocking, bopping, boogeying, tangoing, shaking, rattling and rolling animals! This new original story is sure to get your feet moving. The fun doesn't have to stop with the last page, though! 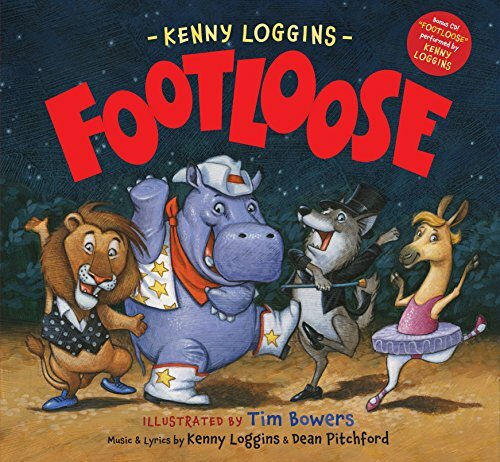 To add to the dance party, FootlooseÂ also includes a free CD with new recordings by Kenny Loggins. Kids and parents can sing along to the classic hit with new lyrics, as well as a three-song medley families to enjoy together time and time again. About: Time to cut loose!